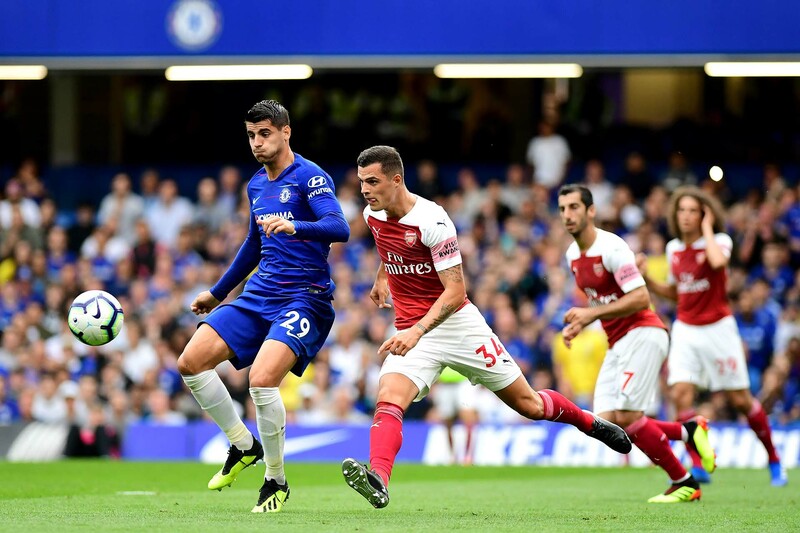 Alvaro Morata and Granit Xhaka of Arsenal battle for the ball during the Premier League match between Chelsea FC and Arsenal FC at Stamford Bridge on August 18, 2018 in London. Chelsea travel to the Emirates Stadium on Saturday evening to take on Arsenal in a match that could be decisive in terms of deciding who qualifies for next year’s Champions League. Right now, Chelsea hold on to the fourth spot in the table, six points ahead of Arsenal. A win over the Gunners, and Chelsea can deal a blow to home side’s chance of finishing fourth by extending the gap to nine points. But to do so, Chelsea will have to be much more clinical and decisive in front of goal than they have been in recent weeks. Chelsea’s lack of an striker has been noticeable since the festive period, and Eden Hazard is likely to continue in the striker role, as Alvaro Morata looks to be on his way out and Olivier Giroud is nursing a minor ankle injury. Maurizio Sarri would have been hoping that the deal for Gonzalo Higuain would be wrapped up in time to register him for Saturday’s match. But the deadline wasn’t met, and he’s likely to be confirmed in the near future. Unai Emery and Arsenal have their own set of problems. Both Hector Bellerin and Nacho Monreal have been out injured and left Arsenal short at the fullback positions, but both could return on Saturday. The long-term injury to Rob Holding has also left Arsenal short at centre back, even though Laurent Koscielny has returned from his Achilles tendon injury. More concerning is the negative cloud that hangs over the future of Mesut Ozil. The German international signed a new contract last year, but Emery hasn’t been convinced by him this season. Ozil didn’t feature in the last four matches. Reports are claiming that he’s nursing an injury, but Ozil doesn’t seem particularly happy to be playing a bit-part role this season. Emery’s approach on Saturday should be interesting since he’s been playing a back three this season in order to get Pierre-Emerick Aubameyang and Alexandre Lacazette on the pitch at the same time. It’s a system that Chelsea are well familiar with having played it under Antonio Conte. Given that Chelsea play with a midfield three, Emery has a choice of playing with Alex Iwobi or Aaron Ramsey; the former giving him an attacking presence and the latter giving him runs from deeper and possibly better cover in the midfield. For both teams, a win is almost vital given the form of Manchester United in sixth place, but perhaps more is on the line for Arsenal. A loss to Chelsea, and Arsenal could find themselves in sixth place behind the charging United, but a victory puts them within touching distance of Chelsea and ensures that United stay in sixth place. A Chelsea win, on the other hand, opens up a gap to their rivals for the top four and gives them margin for error in case their struggles in front of goal continues and more draws are on the horizon.